At the Head Office or the location from where you will manage multiple branches (can also be one of the branches) you need to use the ROBOTILL Branch Module. The Branch Module is not used on its own, but with ROBOTILL Manager (you get a key for both if you purchase a license for the Branch Module). From ROBOTILL Manager you will do all the product setup and print design that can be rolled out to the various branches using the Branch Module. All till points (POS Computers) and back office computers on the ROBOTILL system uses SQL Server on a local network. The branch module however allows you to update branches at any location over the Internet. ROBOTILL uses Google Drive for this and before you start setting up branches in the Branch Module, you first need to set up Google Drive. The Branch Module is part of the standard ROBOTILL installation. In your Windows Search bar just type 'ROBOTILL Branch'. You could also open it from 'All Apps' > ROBOTILL > ROBOTILL Branch. You could right click on the icon and pin it to your task bar for easy access in the future. Follow these steps to register your ROBOTILL Branch module. In the ROBOTILL Branch module, select Branches > Add Branch. The name is the name of the branch and the Branch Code is any unique 5 character branch code (unique within your organization). Click on the browse button. In the Browse for folder box, expand the user and then Google Drive and select the branch folder for that specific branch. Depending on whether you are using Google Backup and Sync or Google Drive File Stream, the folders will be in different locations. 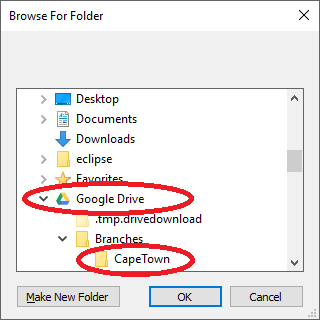 An easy way to find the correct folder is to use your Drive or Backup and Sync icon in the system tray and then click on 'Open Google Drive Folder'. It will open the root folder. You can then just go to the correct sub folder for the branch. Click on 'Add Branch'. You can add as many branches as needed. You do not need to create a google drive folder for the head office branch. Instead create a local folder on the computer from where you will use the ROBOTILL Branch module and select that folder instead.